hereinafter referred to as the second party; both of said parties being residents of the County of Los Angeles, State of California. That there is one child as the issue of said marriage; Lois Laurel, of the age of about five years. SECOND: That the parties hereto, at the present time, are living separate and apart; that there is an action for divorce now pending between the parties hereto, in the Superior Court of the State of California, in and for the County of Los Angeles, and being numbered and entitled: No. 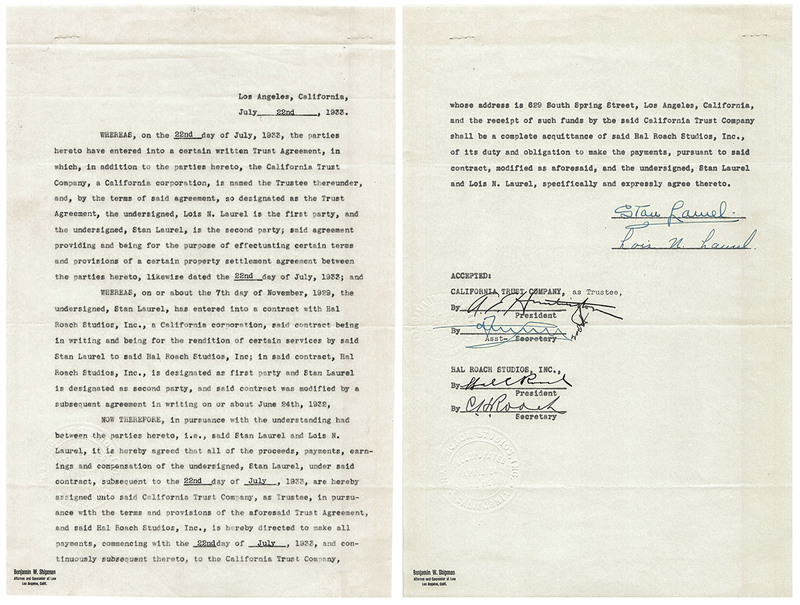 D112260, “Lois N. Laurel, also known as Lois N. Jefferson, plaintiff, v. Stan Laurel, defendant”, and that the parties hereto are not only desirous of effecting a settlement of their property rights in the light of such pending action, but expressly intend that this agreement shall continue in full force and effect in the event that their respective differences can be composed and a reconciliation, whether permanent or otherwise, take place; that this agreement is also intended to fully supplant, change, alter and revoke any and all prior agreements between the parties hereto. THIRTY-SIXTH: Should any difficulty arise between the parties in the appointment of counsel mutually agreeable to them for the purpose of instructing the Trust Company pursuant to the terms hereof, it is understood that if the parties cannot agree, upon the application of either, such appointment may be made by a Superior Court of the State of California. WHEREAS, on or about the 7th day of November, 1929, the undersigned, Stan Laurel, has entered into a contract with Hal Roach Studios, Inc., a California corporation, said contract being in writing and being for the rendition of certain services by said Stan Laurel to said Hal Roach Studios, Inc., in said contract, Hal Roach Studios, Inc., is designated as first party and Stan Laurel is designated as second party, and said contract was modified by a subsequent agreement in writing on or about June 24th, 1932. NOW THEREFORE, in pursuance with the understanding had between the parties hereto, i.e., said Stan Laurel and Lois N. Laurel, it is hereby agreed that all of the proceeds, payments, earnings and compensation of the undersigned, Stan Laurel, under said contract, subsequent to the 22nd day of July, 1933, are hereby assigned unto said California Trust Company, as Trustee, in pursuance with the terms and provisions of the aforesaid Trust Agreement, and said Hal Roach Studios, Inc., is hereby directed to make all payments, commencing with the 22nd day of July, 1933, and continuously subsequent thereto, to the California Trust Company, whose address is 629 South Spring Street, Los Angeles, California, and the receipt of such funds by the said California Trust Company shall be a complete acquittance of said Hal Roach Studios, Inc., of its duty and obligation to make the payments, pursuant to said contract, modified as aforesaid, and the undersigned, Stan Laurel and Lois N. Laurel, specifically and expressly agree thereto. 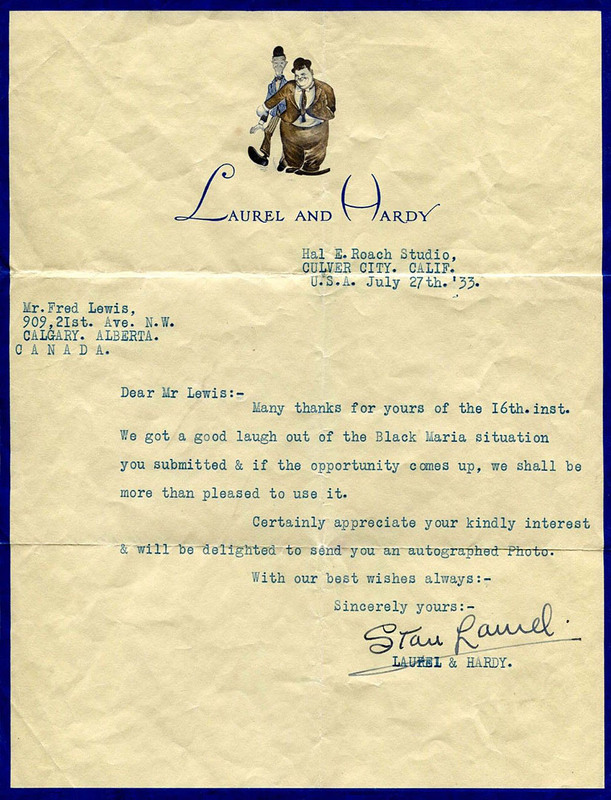 THIS IS TO ACKNOWLEDGE that we have received instructions from Stan Laurel and Lois N. Laurel terminating the arrangement whereby the compensation of Mr. Stan Laurel was to be paid to us pursuant to an agreement entered into between ourselves and Stan Laurel and Lois N. Laurel on the 22nd day of July, 1933. We therefore state that we have no further interest in the performance of the directions given to Hal Roach Studios, Inc., on the 22nd day of July, 1933, a copy of which instructions is attached hereto, marked Exhibit A, and, on the contrary, acknowledge that, pursuant to instructions given us, the directions to pay over funds therein related are of no further force and effect and we have no further interest therein. Many thanks for yours of the 16th.inst. We got a good laugh out of the Black Maria situation you submitted & if the opportunity comes up, we shall be more than pleased to use it. Certainly appreciate your kindly interest & will be delighted to send you an autograpged Photo.